Getting found online is one of the biggest challenges B2B companies face. With organic search rules changing periodically based on Google’s updates to their search algorithm, B2B companies have to stay on top of effective search engine optimization strategies to overcome that challenge. To help you understand search engine optimization basics, here are five very common SEO keyword strategy failures that could make the goal of your website getting found on the first page of Google seem like a distant dream. When a multi-million dollar business coaching firm asked me why they weren’t ranking on Google for a specific keyword phrase, I scoured their website and gave them the unhappy news that the phrase in question did not appear anywhere on it. Like many companies, they attempted to use SEO to promote their brand. SEO is not about brand promotion, it’s about helping your audience find you on their terms, i.e., keywords. Once you know what your audience is looking for, use a free or paid keyword tool to expand your list and suggest which keywords are best for you. Unless your company is the 500 lb. gorilla in your industry, one or two-word keywords are not likely to produce results that will make you happy. Instead, use long-tail keywords (keyword phrases) that will help the search engines narrow their focus and are more targeted to the way your prospects search for their needs online. 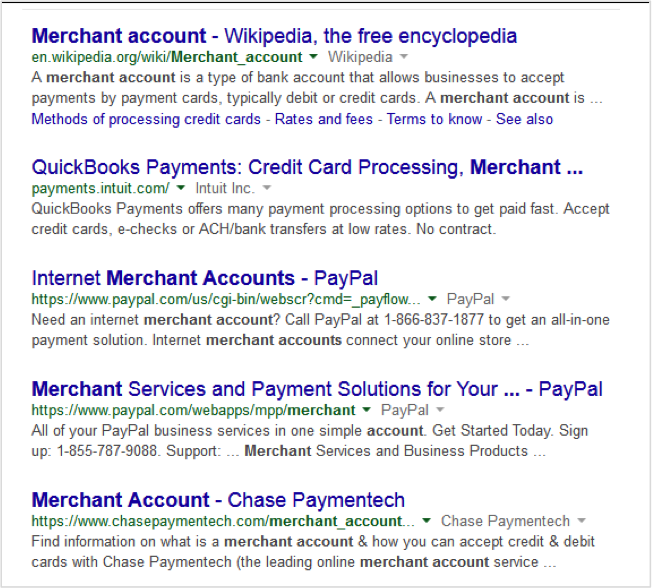 For example, if your company provides credit card processing, look at the results for the keyword “merchant account.” See all the usual suspects? You can’t compete there. But as you dig into the special needs you address, you realize that your company has a program for businesses that take in small amounts by credit card. 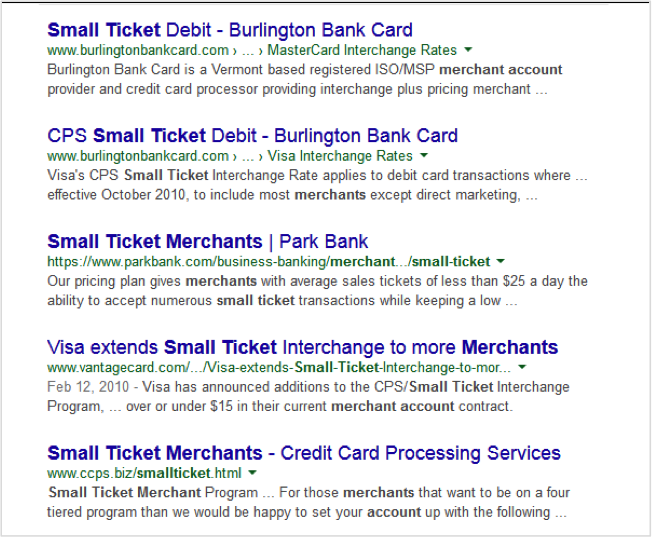 The long-tail keyword “small ticket merchant account” produces a much different result; one with which you can compete. Get as specific as you can with each keyword. People use long-tail keywords. Find the ones your prospects use. Look again at the second image above. Notice the last two listings shown include the words “small-ticket” in the URL. The URLs of pages are the first part of a website that a search engines crawl. For every page on your website, you should have one long-tail keyword that is the primary focus of that page. And, you should put it (or the most unique part of it) in the URL. Every page needs to have its own unique page title. That’s what tells the search engines what the page is about. Many sites have the same title on every page. This common error practically guarantees that your SEO keyword strategy will fail. Not only are your page titles important, but how you word them is equally important. English is read from left to right and top to bottom. 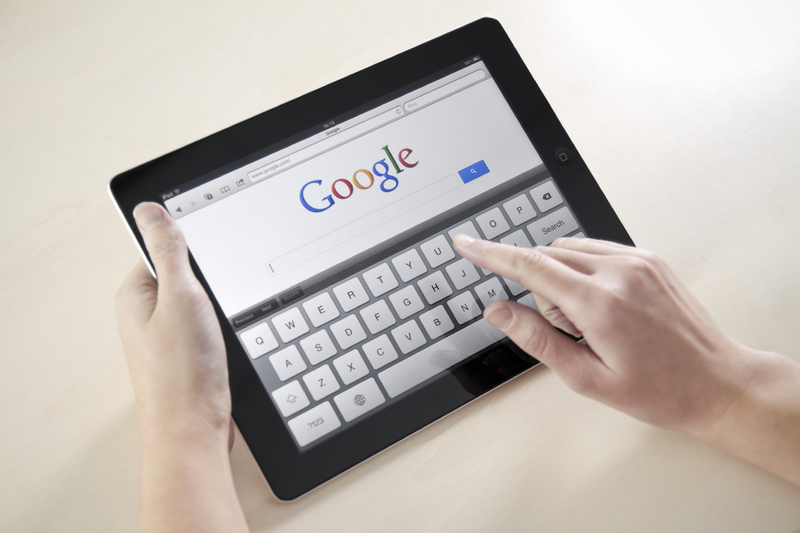 Search engines crawl your website the same way. When crawling a page title, Google considers the words on the left to be the most important. Many companies like to make their company name the first part of every page title on their website. If a digital news distributor company called Smith Technology put the company name first on all their page titles, Google would see that the most important keywords were the same for every page: Smith Technology. Images, video, and .pdf documents have become standard fare on websites. Each presents its own opportunities. Images – Search engines read words, not pictures. They can tell what your image is about by reading the alt tag in your page’s html. The alt tag was created so audio screen readers could tell the visually impaired what an image was about. Many – if not most – websites have no alt text at all or else it just repeats the file name. Use your alt text to describe the image for your human and search engine audience. Video – Since the search engines can’t watch the video, try to include a transcript or summary of the video on the page. .pdf documents – The big mistake most companies make here is in not including links back to the website from the .pdf. Why is that a mistake? Because search engines now crawl .pdf documents. If someone gets to your .pdf from a search engine, they will not be able to find your website unless you include links. When you add new content to your website, it gives the search engines a new reason to come back and crawl it again. Static websites don’t improve their search engine results, no matter how well you use keywords. Incorporating these search engine optimization basics into your digital strategy will improve your search engine results positioning (SERP) and help get you found by your prospects. 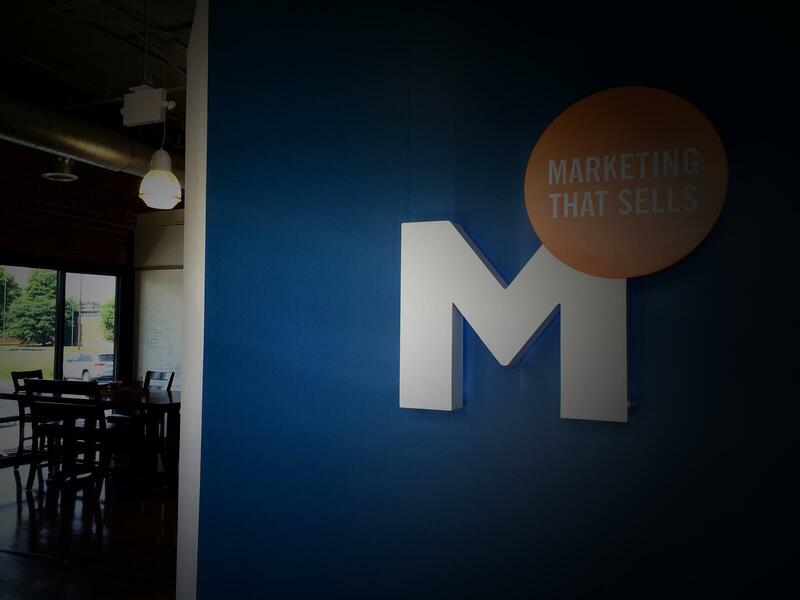 Want to make sure you get inbound marketing right the first time? Download our eGuide, How to Jumpstart Your Inbound Marketing Program: 10 Steps to Get More Leads.